Flagraiser IPA is a big, hoppy tribute to the unfurling of the Grand Union flag atop Prospect Hill in Somerville, MA on January 1, 1776. This ale celebrates our passion for hop aroma and flavor balanced with just the right amount of malt. Huge aroma and resin-y flavors from the elusive Galaxy hops are the signature of this beer. Built on a solid base of pale malts, this double IPA makes generous use of hops from Columbus, Crystal and Galaxy with the Galaxy hops taking the lead during ten days of aggressive dry-hopping. A refreshingly tart and crisp hefeweizen brewed with local MA wildflower honey, orange peel and coriander, and fermented with the juice from over 1,000 blood oranges. It’s a cloudy, yet effervescent beer, with lingering banana and citrus notes balanced against a healthy wheat backbone and hoppy finish from Mt. Hood and Crystal hops. An autumn brown ale with distinctive toasty flavors from an assortment of roasted malts and grains. As a seasonal, fall beer, its nutty characteristics offer a great companion to colder climate cuisine. A bright hop finish from Cascade and Fuggles balance the toasted grain notes to create a new expression of autumn brown ales. Finding new zymological expressions is a noble dedication of the craft beer enthusiast. For those committed to the adventure of seeking new styles, beer destinations and breweries, we applaud you and dedicate this golden Belgian-style trippel ale.This smooth and alluring Belgian golden ale is full of complex fruity pineapple flavors set against a spicy finish. Dried jasmine flowers added in the boil work with a higher alcohol level to augment Belgian pilsen, caramel and honey malts. Hop character is distinctly Chinook with an aromatic peppery finish that comes from Motueka hops grown in New Zealand. It wasn’t always his temperament, but they were the ones ... the ones that went looking for him after all. Today is a new day. 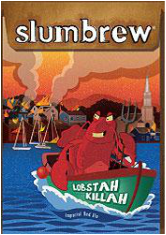 Lobstah Killah Imperial Red Ale is a special blend of Maris Otter and other malts balance a resiny mix of Columbus, Cascade and Simcoe hops. Our hoppy imperial red ale is the beer of choice for imperial decisions. You could gift this bottle as a reflection of your fine craft beer taste, drink it now to ease your holiday tension or cellar for the long winter ahead. For our first year of our Yankee Swap beer series, we selected rum barrels from our friends at Turkey Shore Distilleries and dark maple syrup from North Hadley Sugar Shack. This Strong Ale is a big beer with hints of maple and complex notes of oak and rum from the Old Ipswich rum barrels. Rich black porter with a unique blend of chocolate, coffee, roasted and nutty flavors. Brewed with cocoa powder and conditioned with cacao nibs from Taza Chocolate. Bold flavors from the cacao nibs and black malts are balanced with a special blend of pale malts, oats and wheat to produce a lush and lingering mouthfeel. Porter Square Porter- Glass 22oz/12ct.